Between "Roxanne" and "Message in a Bottle," everyone has a favorite Police song. By fusing new wave, reggae, and jazz into one distinctive sound, merging lighthearted melodies with surprisingly dark and sinister lyrics — seriously, have you ever paid attention to how disturbing "Every Breath You Take" really is? — The Police became one of the most iconic acts of the '80s, even though they were named after a bunch of law-abiding dudes in blue suits and badges. However, the strangest thing about The Police's story will always be the fact that they disbanded at the peak of their success in 1984. 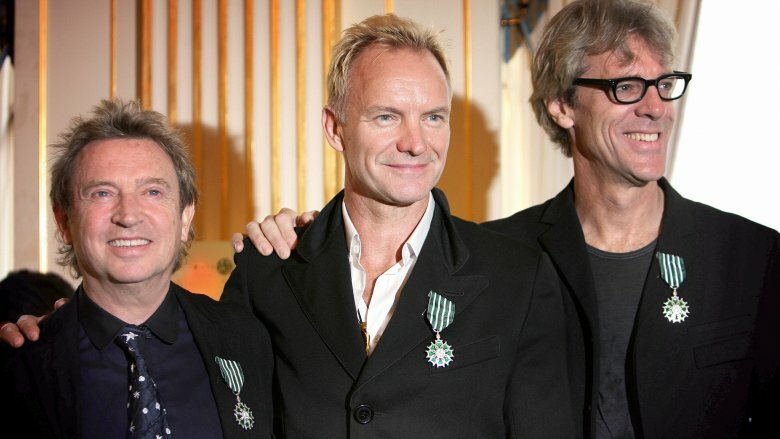 While the electric trio of Sting, Andy Summers, and Stewart Copeland were always known for squabbling, and this messiness was probably the very thing that powered their creativity, the revelation that Sting was moving on from the band to pursue a solo career hit the music world like a suckerpunch. Why did Sting call it quits? 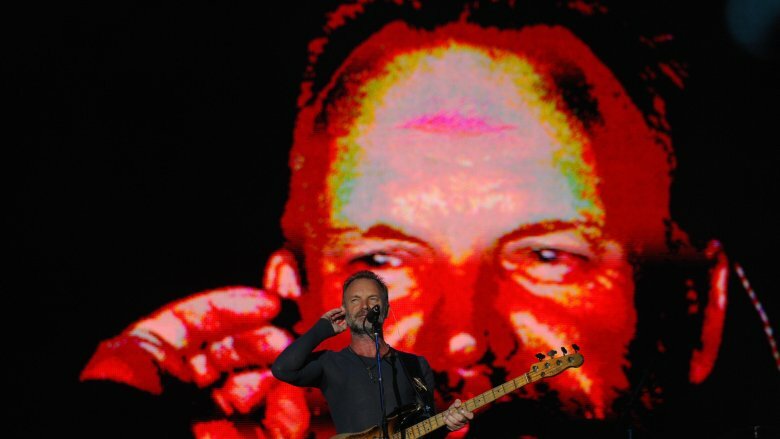 Though The Police would never be The Police without all three band members, there's no dispute that the heart of the band was always singer/songwriter Gordon Matthew Thomas Sumner, the former schoolteacher who became "Sting," a worldwide heartthrob. Back in 1976, the future talent behind "De Do Do Do, De Da Da Da" was helping students by day and performing by night as the singing bassist of a small-time, suburban jazz-funk band, according to Rolling Stone. One night, Sting's hidden talent was spotted on stage by a drummer named Stewart Copeland, the renegade artistic son of a CIA agent. Stewart made a play at convincing Sumner to pack up his small-town life and move to London so they could form a new band together. Surprisingly enough, Sting packed his bags. According to the Guardian, The Police — which Sting named — was something of a lark to start with, but Sting and Copeland were so invigorated by the new energy of the whole thing that they kept going until it took off. Their first guitarist didn't quite fit the vibe, but just in time, Andy Summers rolled along. Seeing the original band playing at the Marquee, Summers was so entranced by both Sting and Copeland that he offered his services. Once all three members were settled into place, The Police were truly born, and they didn't take long to shoot for the stars. In retrospect, the manic energy, creativity, and unique reggae-pop-jazz-punk sound of The Police seems destined to make history. At the time, though, few could have predicted the mega-success the band would be. To be fair, part of The Police's triumph can be, as with most things, chalked up to timing. They hit right when punk was breaking norms across the music industry, and as their official website points out, the band's adventurousness was helped by the fact that each of the three leads came from wildly different musical backgrounds. Organized chaos at its best. Their first album, Outlandos D'Amour, introduced such chart-topping hits as "Roxanne." Only a year later, their second release, Regatta de Blanc, won them a Grammy. 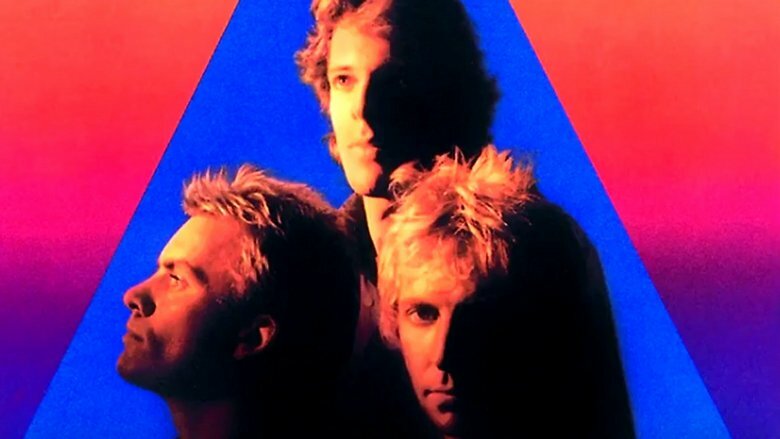 From then on, The Police rolled along to more Top 10 hits, Grammy Wins, and in 1981, they even went double platinum, with the one-two combo of "Spirits in the Material World" and "Every Little Thing She Does Is Magic." By the time the trio reassembled to produce Synchronicity, the album which made them the #1 most played band on U.S. radio, it truly seemed like The Police were unstoppable. Behind the scenes, though, things weren't quite as smooth as they appeared. The Police are a textbook example of how the very thing that makes art successful can also be its undoing. Yes, the differences between all three band members produced the unique sound, but it also led to tension, battles, and explosions. Sting's temper, in particular, may have caused a lot of fights. According to Rolling Stone, Copeland has alluded to physical confrontations. No film of this exists, but Copeland, who taped much of their early days, says that's because he never had a free hand to hold the camera. Meanwhile, Summers has described an incident in which Sting once totally blew up on him, apparently bursting out with a string of insulting comments that left "everyone in the room white-faced and in shock." On another instance, Copeland told an interviewer that, "We were in this state where any little incident would turn into World War III." On the other hand, while it's easy to get judgmental or proclaim that The Police all hated each other, that's not quite accurate. What caused the tension between them wasn't hatred, but the intense closeness that links band mates who shared vans, hotel rooms, and more. In an interview with the AV Club, Summers said the three musicians were like brothers. Looking back at early interviews, it seems the media was putting a huge focus on the band's conflicts, and perhaps heightening them, by singling out Sting from the others. After all, fighting bands make better stories than peaceful ones. Harmonious or not, the spark that held The Police together was fragile, and it doesn't seem likely that it was going to sustain itself forever. Rolling Stone reports that after the band became a success on the strength of Sting's songwriting, it caused a power shift: The formerly democratic three musketeers came to be dominated by Sting's personality. 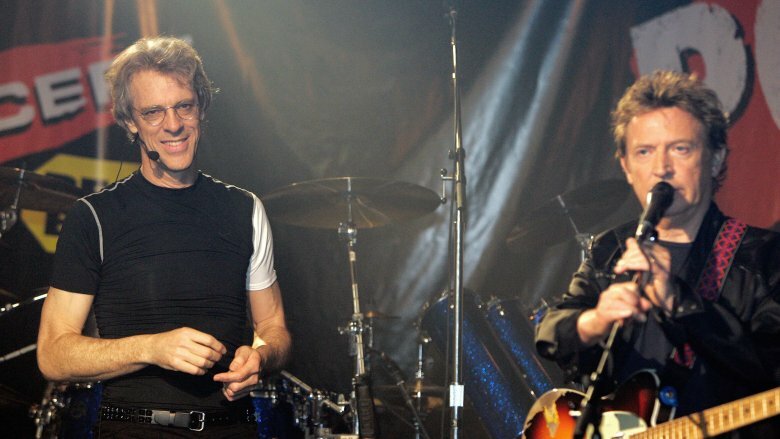 Summers and Copeland attempted to write songs, which Sting claims he was forced to reject for quality reasons, driving a wedge between him and his band mates. 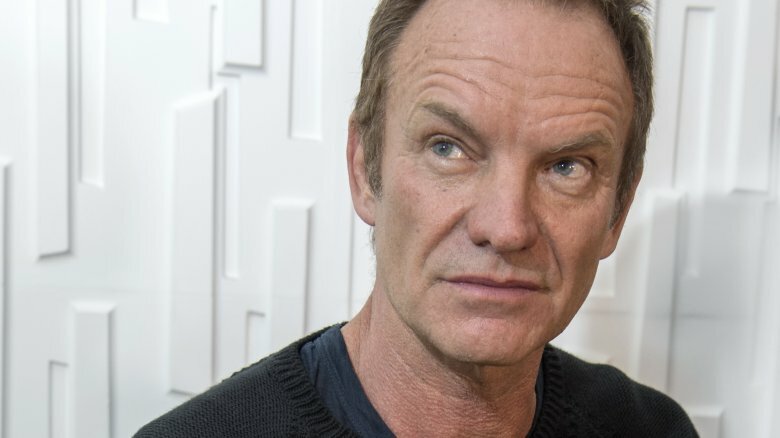 When it comes down to it, Sting says the end of The Police was always going to happen sooner, rather than later. He argues that he, Copeland, and Summers all came from such different backgrounds, generations, dreams, and interests that the "flag of convenience" that brought them together couldn't hold. While fans across the world mourned the death of The Police in 1984, the attitudes of the members themselves were dramatically different. All three musicians assert that the group's termination was a good thing, rather than a bad one, which helped preserve The Police's reputation for eternity. According to the Guardian, Copeland says while everyone always asks what went wrong, he feels like the band broke up at exactly the right time, and the real tragedy would've been if they stuck together so long that they self-destructed. And hey, when you look at other messy rock star groups from the 20th century, Copeland's explanation makes a lot of sense. Why did Sting drop The Police? From an outside perspective, the breakup of The Police at the height of their fame came totally out of left field. Sure, there were conflicts and creative disputes, but what band doesn't have those? When you're that crazy successful, who walks away? Sting, that's who. According to Rolling Stone, Sting's decision to leave the band was not despite their massive success, but rather, a direct result of it. After years of chasing fame and fortune, Sting only found unhappiness on the other side and fell into a depression. He desired deeper, lasting fulfillment of a sort that The Police was no longer offering him, and as his creative instincts turned toward a solo career, the gulf widened between him and his band mates. Honestly, the writing was on the wall. Have you ever listened to "King of Pain" closely? Yeah, those lyrics definitely weren't written by a happy dude. After finishing the 1984 tour for their mega-hit Synchronicity, the band took a hiatus, and Sting started pursuing solo projects. The Seattle P-I says they reunited in 1986 for a few Amnesty International shows, and this revived enough interest among the trio to meet up and attempt a new album, but the results were disappointing for all involved. 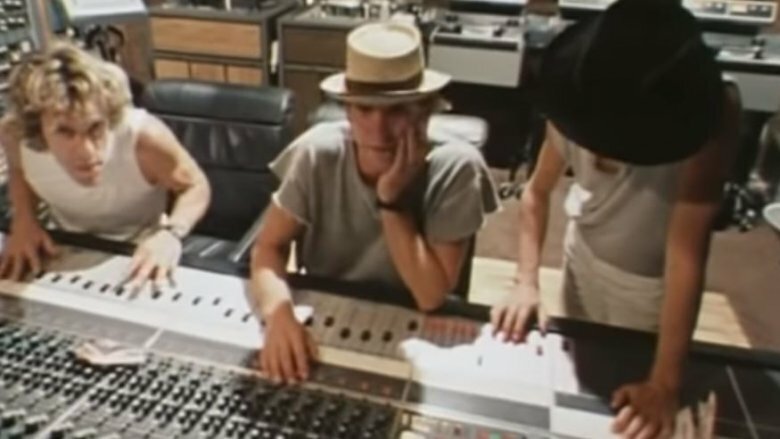 According to Summers, Sting was obviously uninterested in the project, and no new songs arose, so The Police sputtered to a finish. Tangled breakups aside, no artist or creative professional who is honest with themselves can truly blame Sting for wanting to pursue other avenues: If your heart isn't in your old project anymore, it's time to move on. Besides that, the massive results of Sting's solo career truly speak for themselves. While his time with The Police will always be what he's most remembered for, his later works have been known for their creative and unpredictable turns. As Ultimate Classic Rock explains, Sting's first strike into solo work was a dramatic departure from The Police, as he launched with an album titled The Dream of the Blue Turtles. To make it happen, he recruited an array of fellow artists to meld jazz and rock together into something entirely different. Sting's experiment quickly rose to #2 on the Billboard chart, nabbed four top singles, and even earned him some new Grammy nominations. As the years have gone on, Sting's work has become only more unconventional, precisely because he doesn't like being boxed in. In one interview, he said, "The more people pigeonhole me the more my freedom is impaired. I want to be able to change what I do." Understandable, for sure. However, despite Sting's initial intentions, the story of his time with The Police wasn't quite over. Sting's name carries the starpower, but Andy Summers and Stewart Copeland were also key to the band's success. 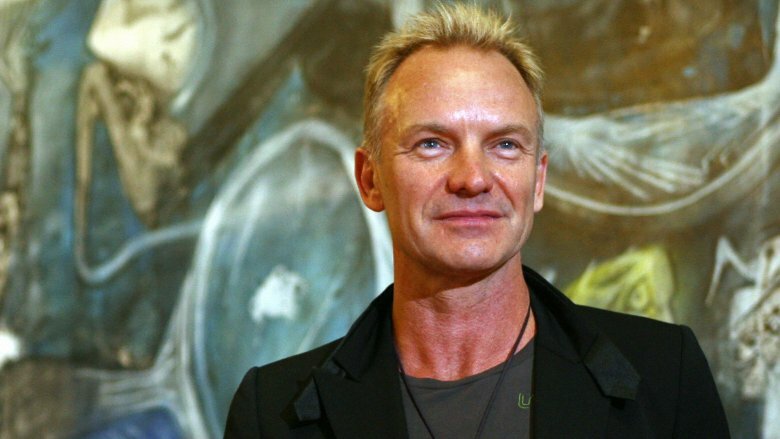 Sting broke up the band and he has continued being a household name ever since, but the other two musicians have racked up some rather major successes in their post-Police lives, as well. Andy Summers, according to Biography, went on to become a prolific solo artist, both for his jazz albums and his experimental instrumental compositions, and even played at Carnegie Hall in 2005. He's also done the score for a number of popular films, including Weekend at Bernie's. Stewart Copeland has been responsible for an even more recognizable list of film and television scores, according to Ultimate Classic Rock, including Babylon 5, Wall Street, Highlander 2, and Dead Like Me. Copeland has also experimented with opera and ballet. He took a decade-long break from drumming before finally returning to his first love as a member of Oysterhead, which joined him with Primus' Les Claypool and Trey Anastasio of Phish. After Oysterhead, he joined Gizmodrome along with Mark King, Vittorio Cosma, and Adrian Belew. 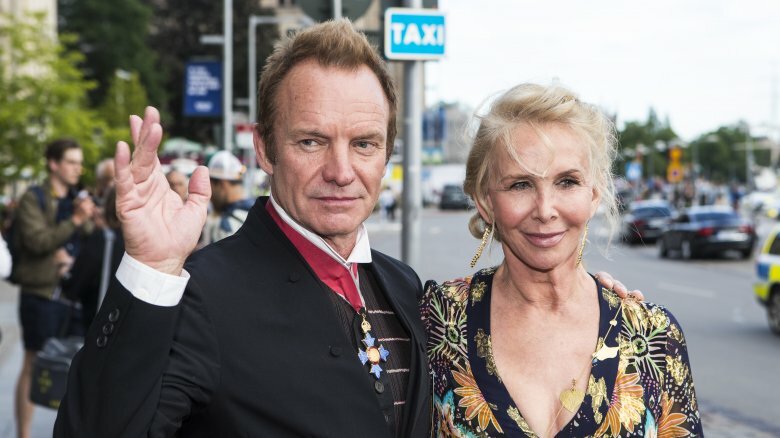 In 1992, many years after The Police broke up, Sting was married to longtime love Trudie Styler in Wiltshire, England. (Happily, the two are still together today.) As any good host should do, he invited his old band mates Summers and Copeland to the wedding reception. It was big gathering, so maybe he thought no one would notice the fact that, yes, all the former members of The Police were in the same venue. But people noticed. People made demands. All three musicians found themselves pushed to rally together on stage, and when the scheduled band finished their set — leaving their equipment on stage — the pressure went red-hot. Sting wasn't down for it … at first. After all, he was celebrating his wedding, not wanting to participate in a reunion he'd always claimed disinterest in. But a couple drinks later, he threw his hands up and decided to get together with his old friends for the first time in years, and they performed "Message in a Bottle." Despite the former band's initial reservations, they had such a blast that they followed it up with "Roxanne." Needless to say, the crowd went wild, and perhaps even hoped this could be a sign of things to come. But no, The Police weren't ready to reunite. For decades, the trio of ex-Police faced constant questions regarding a potential reunion. It was never in the cards, largely because Sting was passionately against it. That all changed in the mid-2000s, according to Rolling Stone, when Sting — always wanting to surprise his fans — realized the single most surprising thing he could do would be getting The Police back together for one final farewell tour. The other members were reportedly shocked when they got the call, but the contracts were signed in a week. 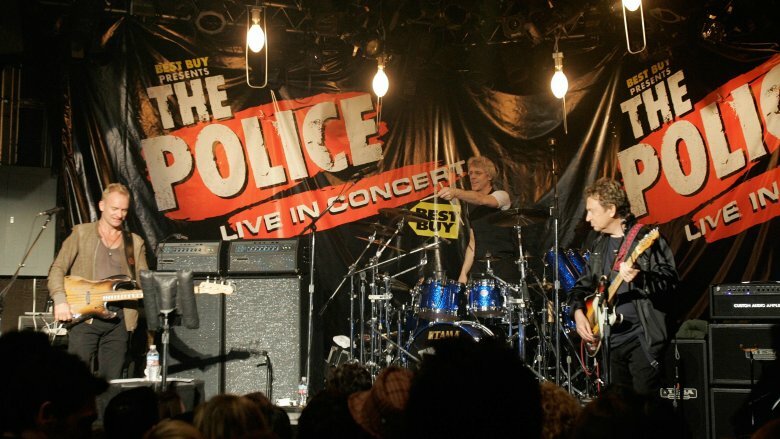 Three months later, The Police did a small set at the Whisky a Go Go, the same stage where they'd had their Los Angeles debut in 1979, and announced that a new tour was forthcoming. When Sting was asked why he was embarking on the one thing he'd said he would never do, he put it frankly: "I know things about the music I didn't know then or couldn't express. I'm a better band leader now than I was then." Surprising? Definitely. Not surprising, though, was that the reunion tour turned out to be a massive success. After 151 new concerts, The Police closed out their impossible reunion tour with a final show in Madison Square Garden, according to Rolling Stone. The Police's last song was "Next to You," the first song from their 1978 debut album, and if that goes down as the last time they ever play together, it's definitely a fitting conclusion for a legendary band.